OK, so maybe those of you with better parenting skills than I don’t suffer through the same cycle of spaghetti, mac and cheese, nuggets, pizza, rinse, repeat. I blame part of it on my husband’s deployment. Sometimes it’s easier to do the easy thing and eat at the counter than to cook a huge meal that one person is going to eat for a week. Lucky for me I wouldn’t mind eating this one for a week. Maybe even longer. Dad’s going to love it, too, when he gets home. I’d tried a variation of this before Dad was deployed, but it simply didn’t work. I cooked it for 10 hours, yet the beans remained crunchy. I have to wonder if Martha Stewart’s test kitchen was off the day it was posted – acid in tomato keeps beans from cooking in a slow cooker, but the simple solution is to add a teaspoon of baking soda. Because I work at home and didn’t have to worry about putting the recipe on auto pilot and forgetting it, I took a different route. I cooked the beans first, then added the rest of the ingredients. It worked wonderfully. I also played with the spices a bit, giving my recipe more of a chili taste than Martha’s original. The results: Fantastic, even without all the sour cream and cheese I pile on. It was a little wimpy by the third day, though. Still tasty, but not very spicy. 2 tsp. chili powder – if you’re living garlic-free, try shopping in a Hispanic grocery or grinding your own from dried chiles. The commercial varieties in mainstream grocery stores all have garlic added. 11/2 c. salsa (1 1/2 cups) – if you’re garlic-free, you’ll need to make your own. 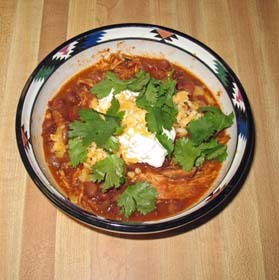 1 small can of chipotle chiles in adobo sauce, chopped – when we were garlic-free I used green chiles instead. And this is way more heat than Martha’s original, which called for only 2 tablespoons. In a 5- to 6-quart slow cooker, stir together beans, onion, water and spices. Cover and cook on high heat for four to five hours until beans are no longer crunchy. Add salsa, chiles and flour. Arrange on top of bean mixture. Cook on low heat for four hours. You can cook it for two hours on high if you’re in a hurry. Remove chicken from stew; shred into large pieces and return to stew. Serve topped with sour cream, cheese and cilantro. I added a side of rice and homemade chips – torillas cut into wedges, coated with cooking spray and a sprinkling of sea salt than baked at 400 for five minutes. The guys ate the rice, chips and cheese, which was fine with me. I didn’t want to share anyway.